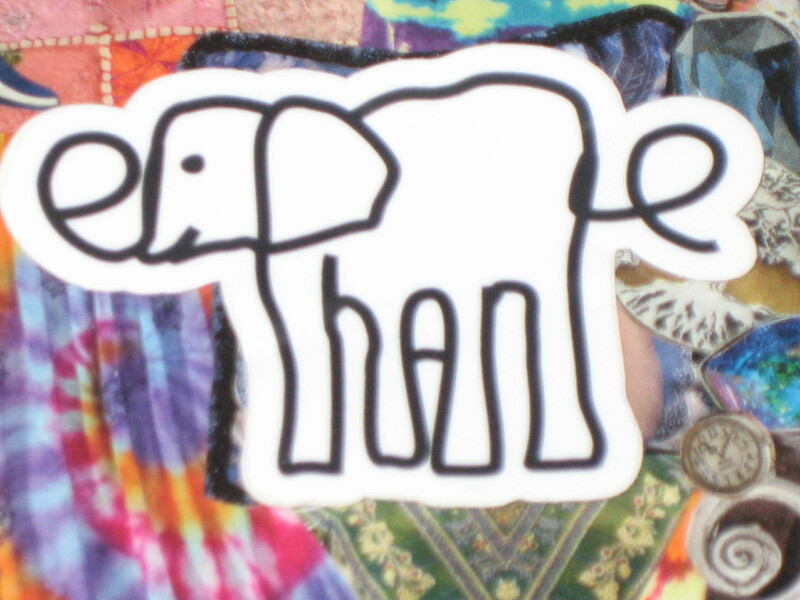 I took this photo of the Eliphante logo on top of one of my collages. Can you see the word “eliphante”? As I was getting my tent up at NeoTribal The Gathering, folks started setting up on my left. They left a nice big space between my tent and theirs, and the space stayed empty most of the day. Late in the afternoon, it seemed as if people were hanging out between my tent and the next one, maybe doing something interesting, so I popped out to see what was going on. 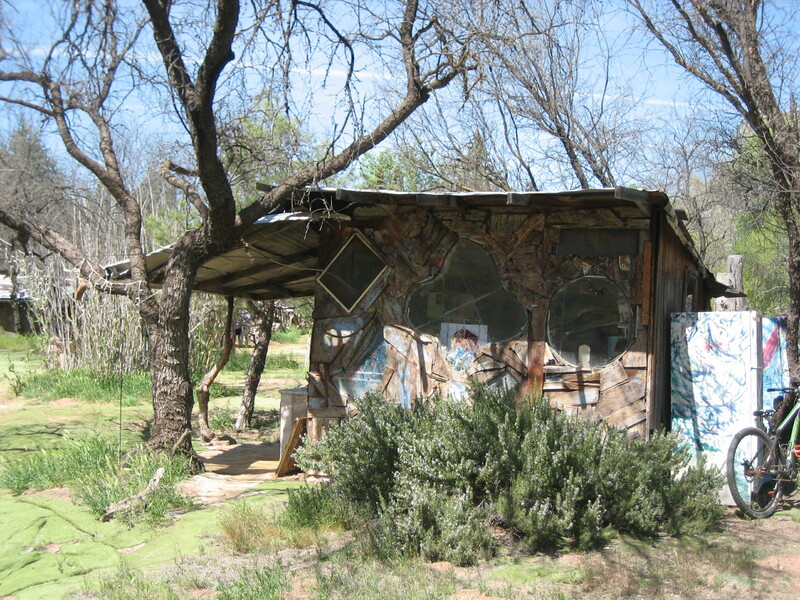 The folks had a book called Home Work: Handbuilt Shelter by Lloyd Kahn. (Find out more about Home Work here http://www.shelterpub.com/_home_work/HW-book.html and here https://www.goodreads.com/book/show/381862.Home_Work?from_search=true.) In Home Work, there were multiple pages dedicated to Eliphante. I looked at the pages and became entranced. I could tell immediately from the photos I saw that Eliphante is a magical place. It turns out that the three people lounging next to me are caretakers at Eliphante. They are artists who live in the “kaleidoscopic, hand-built, sculptural village” to help maintain and restore what was built there by “the artist Michael Kahn and his wife Leda Livant over a 28 year period beginning in 1979.” (Thanks to http://en.wikipedia.org/wiki/Eliphante for basic information.) The folks were at the festival to spread the word about Eliphante and to invite people to the series of events happening there in a couple of weeks. 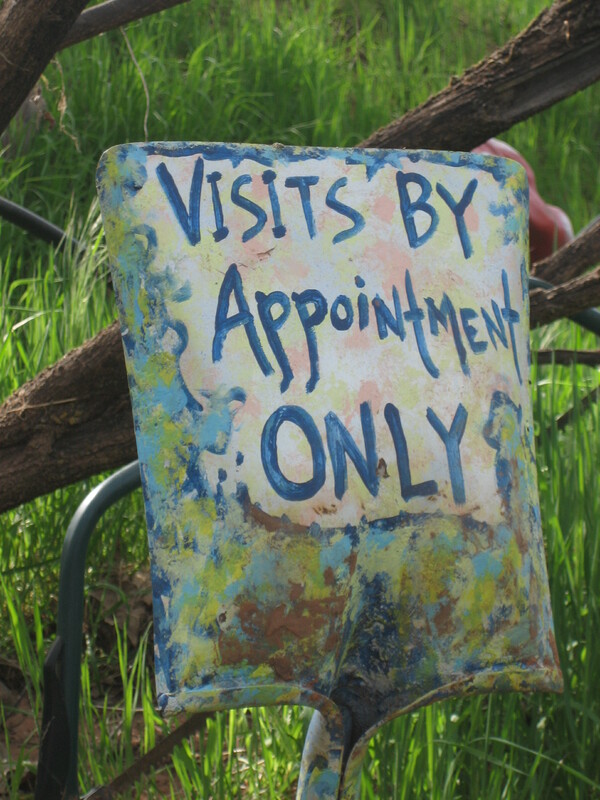 I immediately wanted to go and see the place for myself. I talked for quiet a while to the two guys who were representing Eliphante. They told me the county won’t give the place a permit to host events there (because of the zoning, I think), so all events are open to members only. Memberships are for a lifetime, and folks get membership cards. (One of the guys whipped out his membership card to show me.) I knew I wanted to be a member even before I visited. Eliphante is a private residence looked after and cared for by the 501(c)(3) non-profit Eliphante, Ltd. We are volunteer run and member supported, on an invitational basis to organizational members. Together, we are working to preserve and restore the work of the late artist Michael Kahn and his wife Leda Livant. On the day I visited, there was an accident on I -17 that brought traffic to a complete standstill. (I was listening to the Grateful Dead, so I just danced in my seat and didn’t let myself be bothered by the delay.) I got to Eliphante later than I had planned, but still with plenty of time to look around during the period when they were receiving guests members. The directions I’d been sent were very good, and I only had to stop to consult the map once, when I thought I’d missed a turn. Actually, I hadn’t gone far enough to get to that turn. Once back on track, I found the place easily, although no one in a vehicle could stumble upon the place. There are no signs directing drivers to the property. Upon arrival, I found the creek still flowing. I didn’t realize there were rocks arranged above the level of the water on which I could have walked across, so I just lifted my skirt and waded through. ( I was glad I was wearing my sturdy, all-terrain Keen sandals). This is a photo I took of the Winter Palace, the first home of Michael Kahn, and his wife Leda Livant Kahn. They built it when they first moved to the Cornville area. This is a side view. The entrance is under the awning. 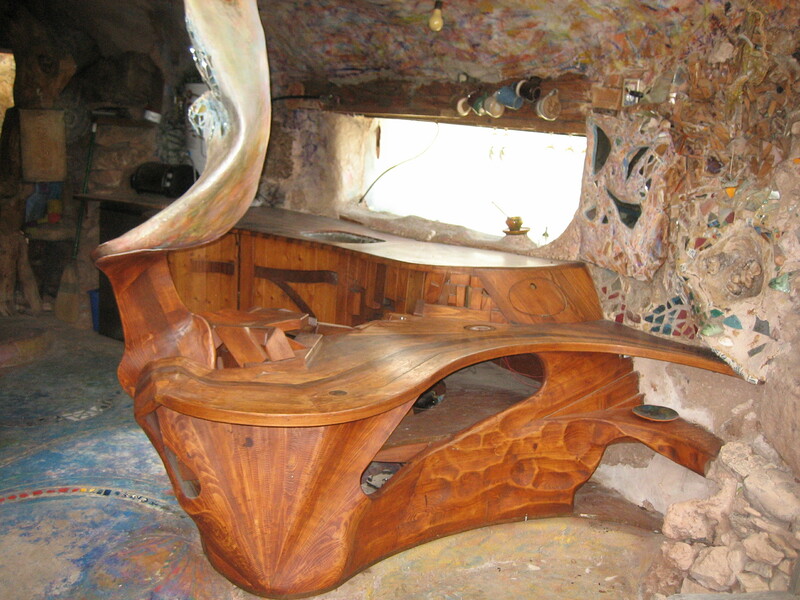 The space is a gallery of sorts, as it houses items for sale made by artists associated with Eliphante. The one-room building is very tiny, and I told my guide that I can imagine living in such a small space alone, but not with another person, even another person I loved very much. The first building I explored was the Hippadome. I took this photo of the front entrance of the Hippadome. 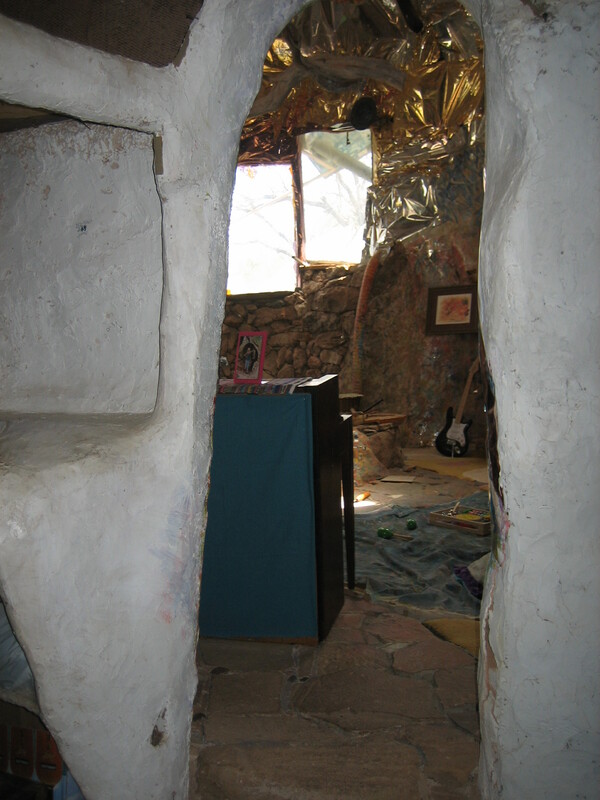 When I walked in, there were several people sitting around in the main room of the dwelling. I was greeted by Leda Livant Kahn herself. Wow! What a wonderful person. She told me later that she was born in 1925, and met Michael Kahn in 1979, at which time she left her husband of 24 years and her nearly adult children. (One child was a freshman in college and the other was a senior in high school.) She was 54 when she started the new chapter of her life with Michael Kahn, which definitely gives me hope for my later years. The folks in the Hippadome were preparing to leave when I arrived, so I soon had the place to myself. I explored the many little nooks and crannies and took several photos. Can you find the ceiling fan in this photo I took? 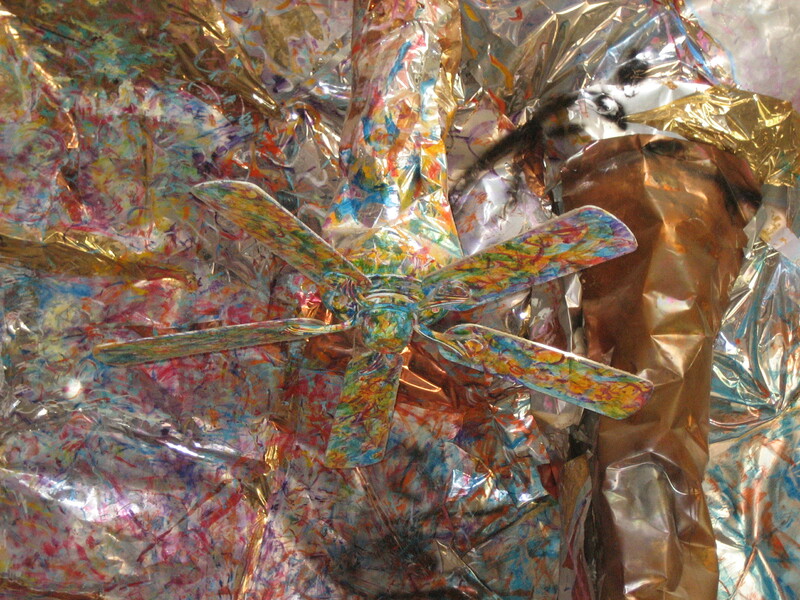 The walls and ceiling of the main room were covered in some sort of metallic paper (I think) and then painted in bright colors. The ceiling fan was painted to match. This is the sink area in the kitchen. 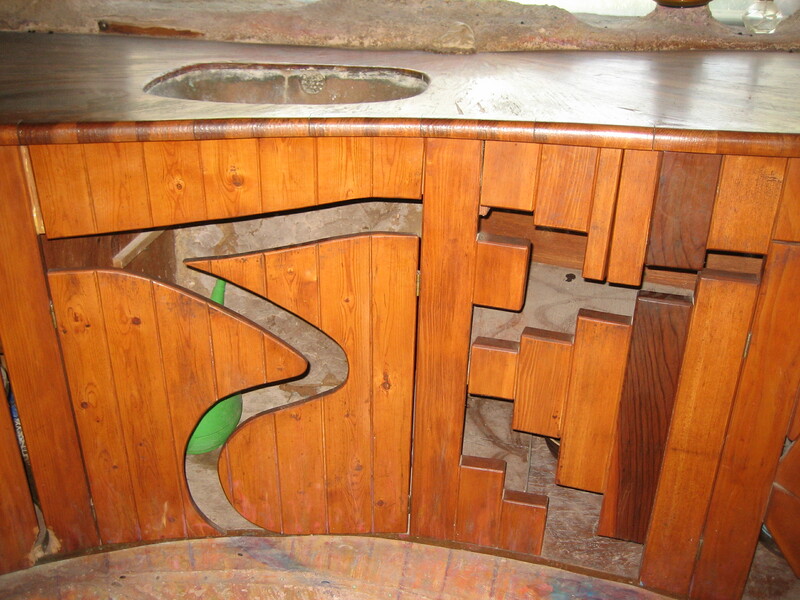 The doors to the cabinets under the sink are made of wood. This is a bar between the kitchen and a sort of nook area leading up to the common room/living area. The bar is made from ultra smooth wood that almost gleams in the light. Notice the floor in the kitchen area. 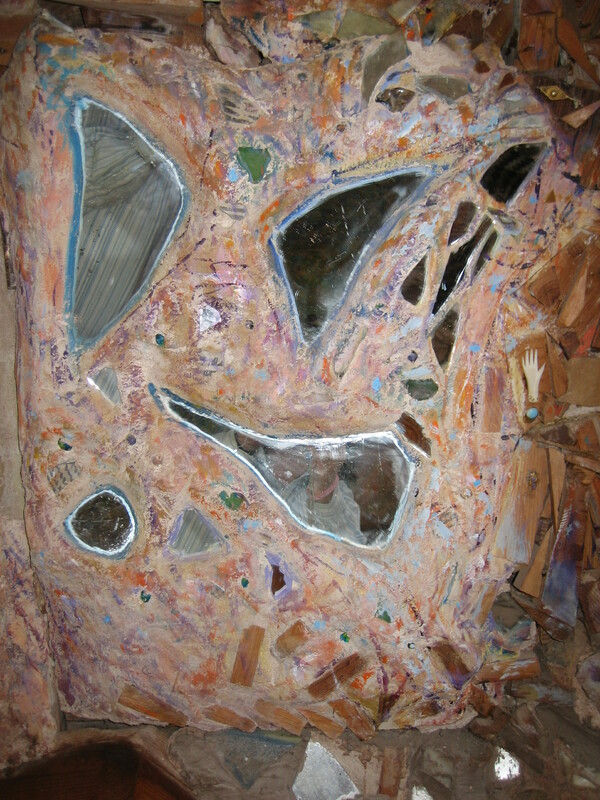 Notice the mosaic wall next to the bar. 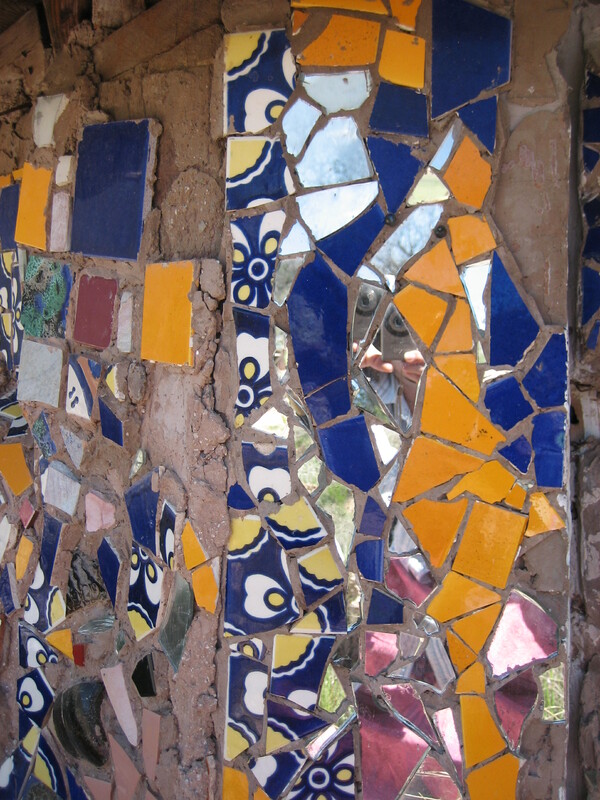 The next two photos were taken by me and are details of the mosaic on the wall next to the wooden bar. 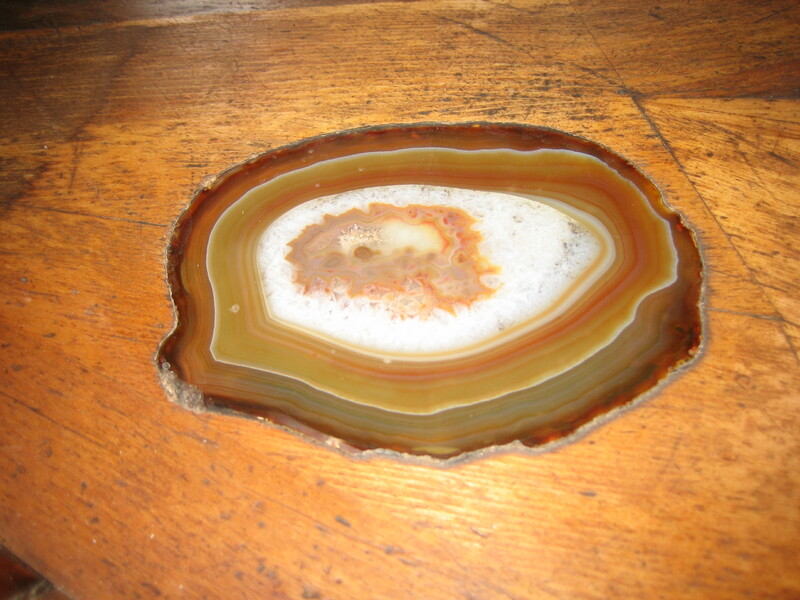 This photo is of an agate slice set in the counter top of the bar. 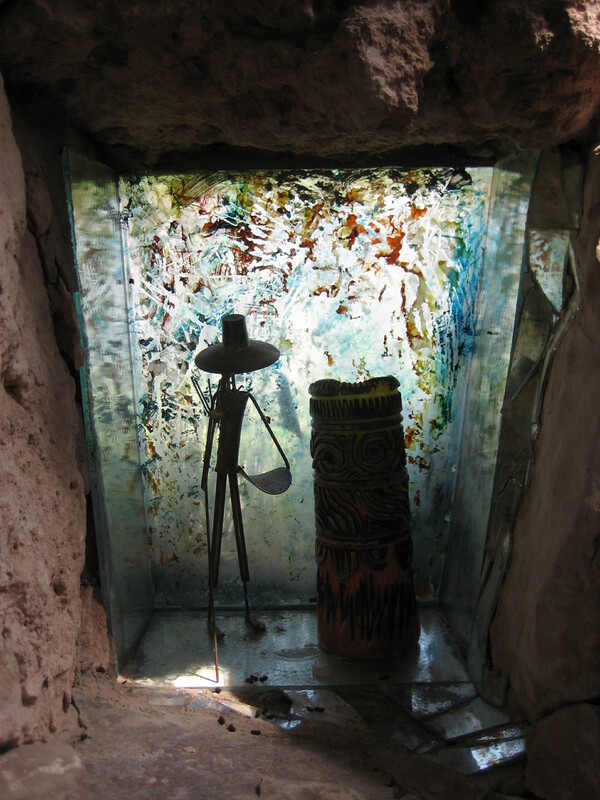 This was a nook in the wall with a “stained glass” window letting in light. Ladder. Tiny door. Sleeping (?) loft. The Hippadome has a second room, with a ladder and what I think is a sleeping loft. On the ground floor of this room were two desks, so maybe it was a work room too. 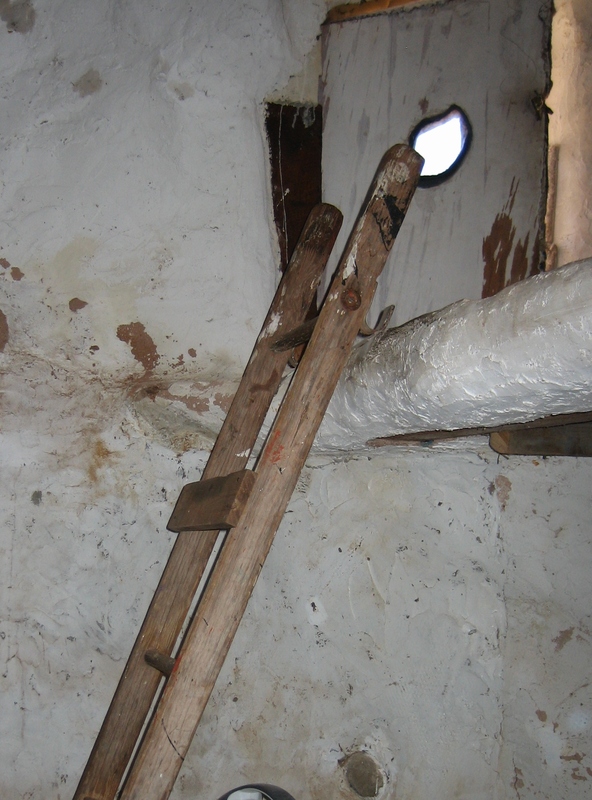 On the second level, just beyond the ladder, there is a small door leading outside. I climbed the ladder up to the loft. That was a precarious endeavor. I thought better of it, but I really wanted to go through that small door, so I heaved myself up at the top. I should have taken my backpack off. I’m glad I didn’t fall. I took this photo from the loft room, looking back into the common/living room. The blue area in the middle of the floor is a cushy soft napping area. Some sort of bedding material has been set into the floor, at the same level as the stones, so there is a comfortable place to lie down. Notice that the walls under the windows are made of carefully stacked stones. 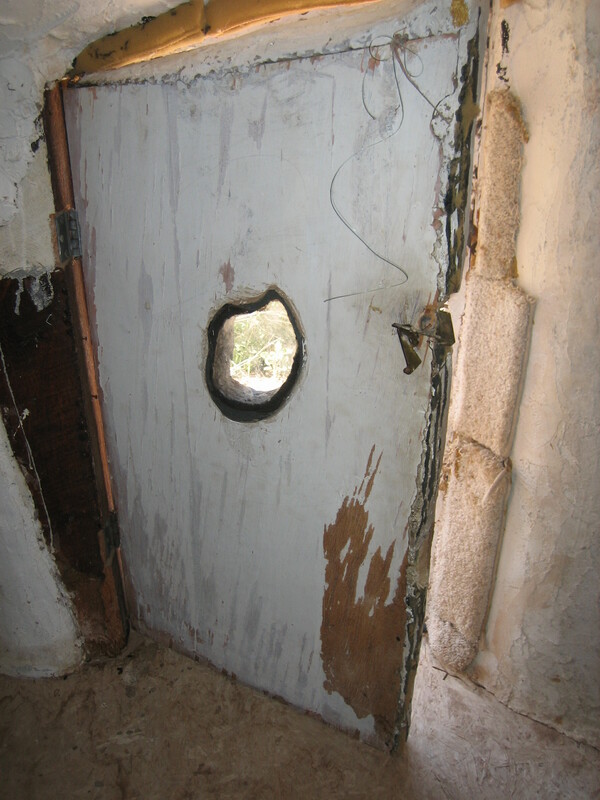 When I tried to go through the small door, I realized two things. This is the tiny door in which I almost got stuck. I took this photo before I tried to cross through the portal. This is what the tiny door looks like on the outside. I took this photo after I extricated myself from the confines of the opening. 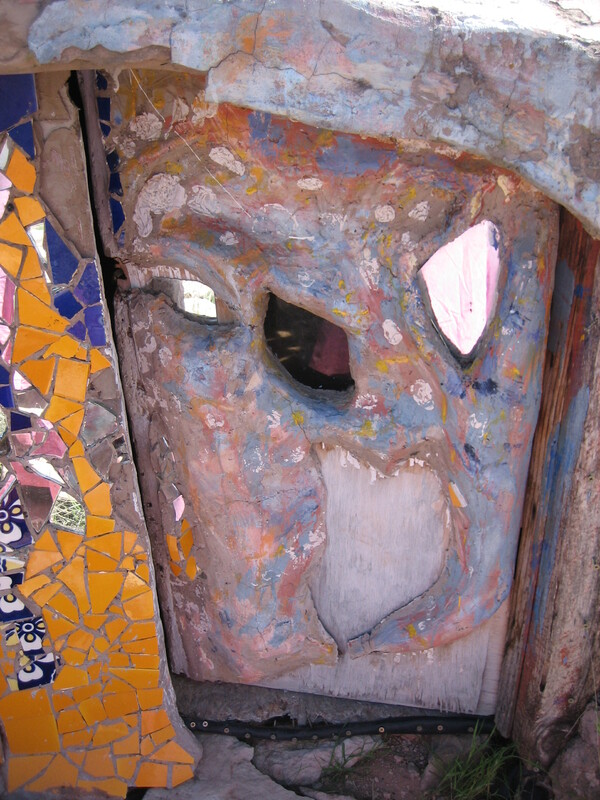 Notice the mosaic to the left of the door. 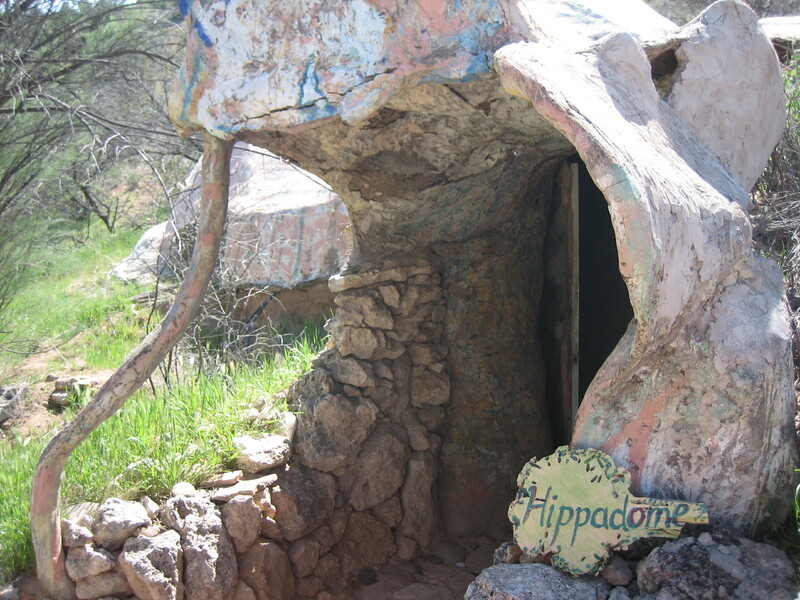 #2 The Hippadome is built into a hill, because when I stepped through that door, I was standing on the ground. 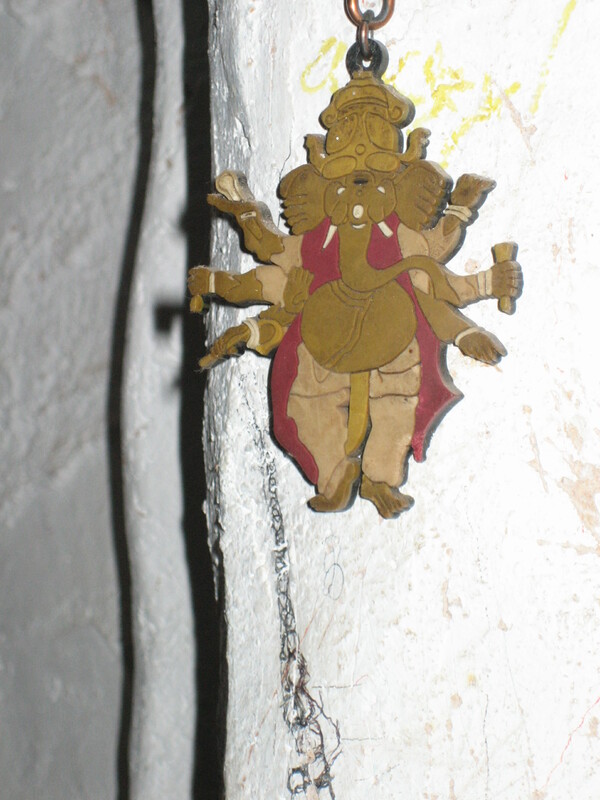 This was hanging on the wall, in the shadows in the loft room. I had to take this photo with the flash. 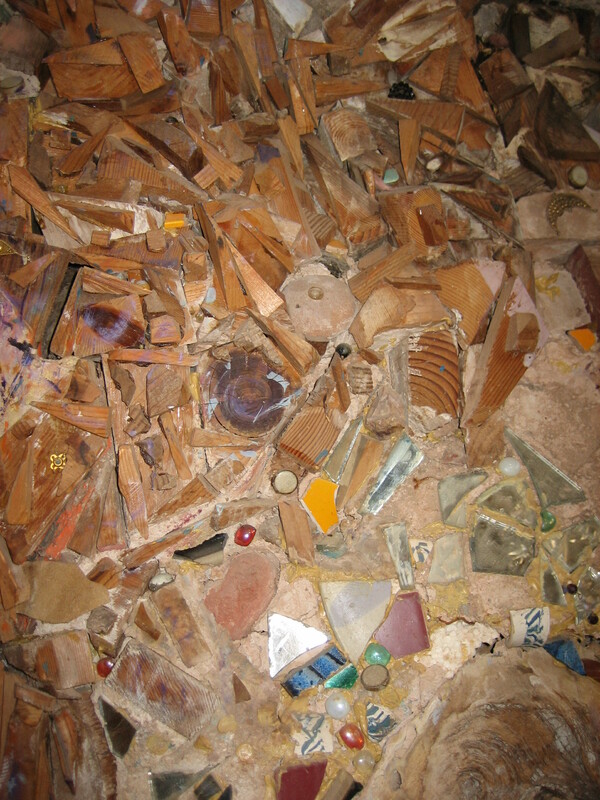 This is one part of the mosaic that covers one of the exterior walls of the Hippadome. It is to the left of the tiny door leading from the loft room to the outdoors. Can you see my fingers and camera in the mirrors? The pink on the lower right is not pink tiles, but the reflection of my pink skirt in bits of mirror. To be continued at http://www.rubbertrampartist.com/2015/08/24/eliphante-part-2/.